St Petersburg Truck Accident Lawyer in Seminole | DeLoach, Hofstra & Cavonis, P.A. Have You Been in a Trucking Accident? The trucking industry is critical to our economy. More products and materials are moved by trucks than any other transportation method. If you drive a car, you will frequently encounter these big rigs, and that can be intimidating. Especially when you consider the number of hours drivers spend on the road and the resulting driver fatigue. Because of their size, increased stopping distances, and decreased maneuverability, trucks pose increased risks to motorists. 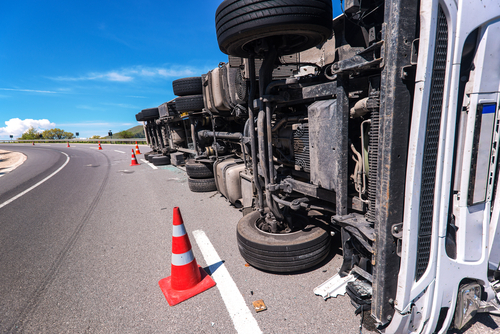 Unfortunately, trucking accidents often result in severe injuries or death. The government recognizes these risks and have passed many regulations governing the operation of trucks, such as how long drivers can be on the road and when they must take breaks. Even so, accidents happen, and when they do, the results can be traumatic. If you have been injured or a loved one has been killed by a truck in Florida, contact one of our Florida truck accident attorneys right away to speak to a lawyer who is experienced and understands trucking regulations. Notify law enforcement to have a full report made. Get all of the pertinent information from the other drivers and witnesses including their full names and all contact information. You also need the vehicle information for every automobile that was involved including the year, make and model of the vehicles involved, and insurance information. Don't assume the police officer writing the report will identify all the witnesses. Preserve all available evidence by taking photos, if possible, of the scene, the vehicles, and any visible injury you have. Most cell phone cameras will work for this purpose. Do not speak with anyone other than the police officer investigating the accident about how the accident happened. Do not admit guilt or innocence on your part. Your statements to the police officer are not admissible in Court. However, your statements to others at the scene are. Seek the advice of an attorney. If you have been involved in an accident with a truck, please do not talk to the trucking company or an insurance company until you consult with an experienced Pinellas truck accident attorney. With DeLoach, Hofstra & Cavonis, P.A., you don't have to worry about the fees. You are not responsible for any of our fees or costs unless there is a recovery. We will advance all of the costs necessary to aggressively pursue your claim. We will never ask you to pay any of these costs out of your own pocket. Contact or call us at 727-397-5571.